Well one advantage of having my daughter work at the PA Ren Faire is that every week she comes home with a grower from the Swashbuckler brew pub. This week it’s the Wiezenbock. To set the stage if you will, here is my quick rundown on the Southern Germany (Bavarian) Wheat Beers, Wiezen (Vice-en). The Hefeweizen is the typical summer wheat ale, usually 50% wheat and barley and around 4-6% ABV maybe up to 7 but usually on the lighter side of that scale. Most are light and refreshing good all-around ales that are widely liked. 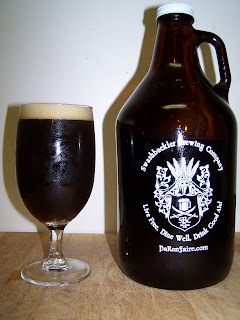 The Dunkel (dark) Weizen is a darker ale brewed with darker more complex malts, similarly 4-7% ABV. These beers have a much richer maltier flavor than the Hefeweizens. More of a cool weather Spring and Fall type of beer. Then you have the big brother of the Dunkel, the Wiezenbock. This is a Dunkel that is, of “bock” strength. Usually much more intense, higher malt characteristics and much higher in alcohol, now we are up to 7-10% ABV. A great Fall or winter warmer if you will. Pours a very dark brown almost completely opaque with a very slight dark amber or caramel hue on the sides of the glass. This beer produced a very rich and creamy tan head. The head was not very long lasting but it never completely diminishes it leaves a nice thin layer on the top of the beer with good lacing throughout. Aromas of rich caramel malts on the nose somewhat sweet by not a sugary sweet it’s a rich malty almost roasted aroma. Very little to no hops on the nose. Oh my, a rich caramel sweetness covers you tongue at first sip. I guess some would call this malty character sweetnes of Dark Fruit. It’s not a candy sweetness it’s more of a fruit sweetness but it’s all coming from those rich malts. And that is all with a very smooth rich creamy mouth feel. Then there is a very pleasant drying effect, I’m not sure if that’s from the hops or the alcohol. I don’t know what the ABV is on this beer. There is a pleasant tartly bitterness on the close. This is a very interesting beer. Nice medium to full body. This beer has a very low hop presence it’s there but the rich malts seem to dominate the experience. The head covering the top of the beer has almost completely disappeared now but there is still excellent lacing left of the glass. I like to let a beer relax and open up for a while when slowing consuming it. As this beer opens up I’m getting more of a hop presence on the nose, a nice pleasant flowering hop aroma, but after a gentle swirl those rich malt aromas make there presence known once again. The beer is now at 54 degrees. There is more bitterness in the taste that wasn’t as noticeable before. Sometimes when a beer opens up and warms up like this the less pleasant aspects of the beer are noticed. Not the case here this is still a very nice experience, this beer still has a lot to offer. The beer is about 60 degrees now. There is now a tough harshness, no, that’s not quite right, I’m having a hard time describing the swallow. I think the beer is so rich as it warms it’s not as easy to go down. That sounds more negative than I intend but it seems somewhat more syrupy now. This is still a very nice experience. The beer however is more intense then it originally appears. After two glasses I can feel the alcohol so I’m thinking this is probably 8 to 9% ABV. All and all this is a very good beer. I haven’t had very many Weizenbocks so it’s hard to give this a rating. The one’s I’ve had have been over the top, like the Brooklyner-Schneider Hopfen-Weisse and the Aventinus from Schnieder. This falls short of them but it is still an excellent Weizenbock. If the above mentioned are A’s then this is a solid B+. I highly recommend this to anyone that likes rich malty beers. A Weizenbock is like the imperial ale of wheat beers. I guess what I’m getting at is that this is a more intense wheat beer more like 3X the intensity of a Hefeweizen so it’s not for everyone. I think this would be a beer I could really enjoy...John, do you know of anything comparable that I could try out here in the midwest? Missy just got a new batch of peeps. Gee it would be a shame to have all of those peeps go to waste. But you are in the mid west. I think these are your two best chances and one is not a Weizenbock. Ayinger Weizenbock, Ayinger is a widely distributed Germany brewer. Woodmen’s should carry their beers. Another good possibility is Samuel Adams, Doppelbock. Doppel or Double bock is a lager not an ale like the Weizenbock. It does however have a very similar malt profile but it is a lager so it will not have the sweetness (dark fruit) flavors of the ales. You can always just label shop for a Weizenbock. I saw the Sam Adams at Woodmans, but don't remember the Ayinger...I'll keep my eyes open and let you know what I find! Went back to Woodman's and found only one Ayinger -- the Celebrator Dopplebock. I picked up the four-pack and had the first last night. This was a very complex beer that will need another bottle before I can give a good description of. I think that I would avoid the peeps with this one, though.